Our Balmoral Leather A4 Deluxe Zipped Conference Folder With Calculator made from recycled leather bonded to form a soft touch finish with an excellent emboss quality. Interior has a multi pocket lay out with gusseted pocket for notes and brochures. 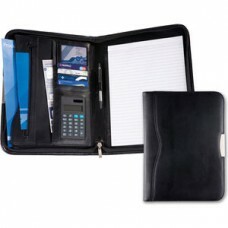 Additional pockets for CD's business or credit card pockets, pen loop and flash stick holder. Secured with a high quality easy glide zip with a chrome zip Pull. Includes a 25 page lined a4 pad. Branded prices include a one position emboss or a one colour, one position screen print. Supplied Boxed.